The Panopticon has been hosting shows for a few months now, and it was a good venue for El Boxeo. 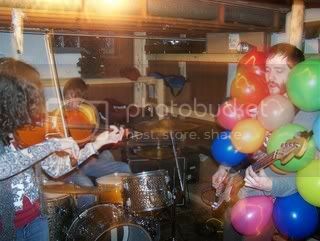 With no vocal amplification, the band played a mostly instrumental set (characteristic of these Livonians), with the exception of a big group sing-along for the final song, “Tons.” Quirky as always, bassist Zach Norton brightened up the dark and damp basement venue with a balloon-adorned shirt. 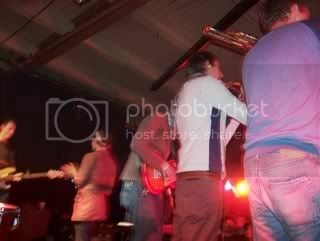 It provided new bass-playing challenges, but the band rose to the occasion and played a great set. The Magic Stick was well populated, which was a very pleasant surprise. I unfortunately missed Those Transatlantics. Page France had spent the day recording with Canada for an upcoming split. The Canadians were invited to the stage for Page France’s final song; lots of clapping, loud singing, hand drumming, an unexpected visitor, smiles and laughs ensued. I think Canada has found its sister band, it was a great combination. Keep on the lookout for recordings and possible tour dates from the French Canadians. Anathallo was magical. Hearing “A Great Wind More Ash” played live was breathtaking. We’re happy to have this band back in Michigan, at least for a little while. Suburban Sprawl Music’s 2006 Holiday Compilation is here! And it’s fantastic! You can listen to the entire album on Suburban Sprawl’s website along with songs from previous years. 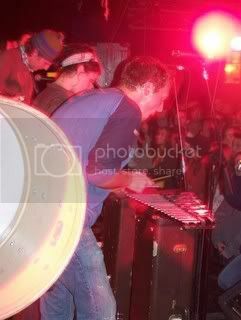 12/12/06- Benoit Pioulard was Spin.Com’s Band of the Day! Mark your 2007 calendars for the Keweenawesomefest. 2 days of music (Feb. 23-24) in Houghton, MI. Bands already booked include: Matt Jones, Misty Lyn, Gregory McIntosh, MC Trashpedal and The Mighty Narwhale. Check the myspace page often- many bands are trying to get into this festival! Finally, Erik and I would like to announce our collaboration with the Ann Arbor based music website, Celestial Biscuit, beginning in January. We’ll be contributing abbreviated versions of our Ann Arbor/Ypsi concert coverage to the site. So be sure to check out Celestial Biscuit for info on the Ann Arbor/Ypsi music scene! Well there you have it. Check back soon for an end of the year concert calendar (it’s an overwhelming list! ), and some of our favorite highlights from the past year. 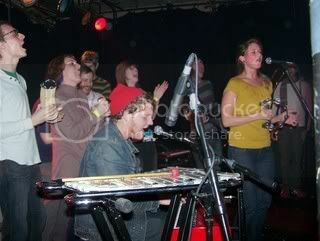 2007 looks incredibly promising for Michigan music. We’ve got our laptops, cameras and (most importantly) ears ready. Annie Moss: a fiesty waif with firey temper and a vulnerable heart that she hides even from herself.